Plastic can take 750 years or more to degrade in a landfill. 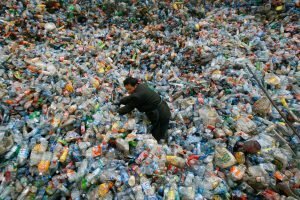 China suddenly stopped accepting all recycled plastic in January 2018–millions of metric tons/year. Plastic recyclables with nowhere to go are piling up across the US. 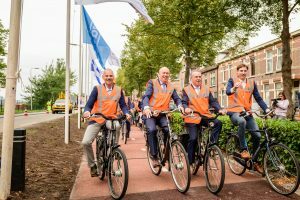 The US is years behind Europe in the roll-out of safe cycling infrastructure and needs to catch up. Plastic has to go somewhere, but where? China is no longer an option. If you’re a forward-thinking entrepreneur, all of these problems fit together perfectly. Plastic lasts forever, and we’ve got way too much of it, so let’s test it as a material for the speedy roll-out of long-lasting, modular bike paths. 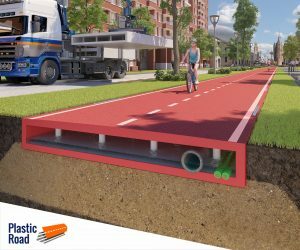 PlasticRoad is a European company that rolled out its first and second live tests of 30-meter long recycled plastic roads in the fall of 2018. Each 30-meter pilot road contains the equivalent of 500,000 bottle caps or 218,ooo plastic cups. It redirects waste stream into much-needed infrastructure in a smart way, with several critical design benefits. PlasticRoad is laid in prefabricated, modular blocks. Built off-site, the only equipment they require locally is for leveling and tamping, with no asphalt heating, pouring, and leveling needed. Bike paths can be built in weeks instead of months. Building a bike path with PlasticRoad is like placing large tiles. Each module consists of a top layer designed for traffic and a lower layer designed to handle water drainage. It eliminates standing water on bike paths after heavy rains, essentially raising a bike path to the same level of functionality as a city street with a far lower cost of infrastructure. Don’t like standing water on your bike paths? This one drains it away under the surface. 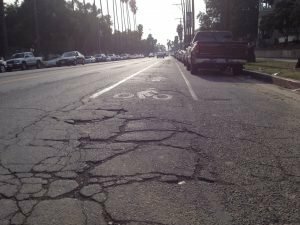 Bike paths in the US aren’t as maintained as city roads. Cracks from tree roots go longer between fixes. Crumbling edges last until the entire surface is repaved. But with PlasticRoad, the entire module is one piece of highly durable, long-lasting plastic. How long will a path like this last? That’s what the Netherland pilot projects in Zwolle and Steenwijkerland are intended to prove. The two pilot projects are embedded with sensors and providing real-time data about usage and wear. Estimated lifespan is three times that of a normal bike path. There are still a lot of unknowns about this new surface, but it sure beats this! Interested in a US-based pilot of this technology? Contact plasticroad@kws.nl.